If you check elevators for safety and weight capacity limits then you probably need large calibrated test weights to do the test. We have those weights available for rental in the state of North Carolina. If you need 1000 pound weights we can provide those or 2500 pound weights are also available. Call us at 919-776-7737 or fill out our online form for additional information. We are located in the triangle area near Raleigh, Durham, Fayetteville and Sanford, NC area. Recently, I was informed of a situation that involved a digital infant scale and a “test weight” also known as a 5 pound consumer barbell weight. Apparently, the barbell weight was used to check the digital scale and it was thought that the scale had not been calibrated correctly due to a scale readout of 5.2 lbs. Actually, consumer barbell weights like those used in the above scenario are manufactured to tolerances between +/-1% and +/-7%, a significant range of tolerance as compared to NIST certified test weights. Using a consumer barbell weight with a wider manufacturing accepted tolerance than the scale may result in a scale display reading that seems inaccurate. A +/-5% tolerance on a 5 pound consumer barbell weight means the weight can weigh from 4.75 lb to 5.25 lb and still be sold as a 5 pound weight. Compare that to a 5 pound NIST Class F weight which is manufactured and adjusted to within +/-230 mg tolerance. In the example above, the user contesting the calibration accuracy of the digital scale checked their consumer barbell weight again, this time on a certified Legal for Trade scale and found that it weighed 5.2 pounds, meaning the digital scale was correct. We recommend using NIST certified Class F Sealed manufactured test weights in most applications to check or calibrate medical scales and industrial scales. 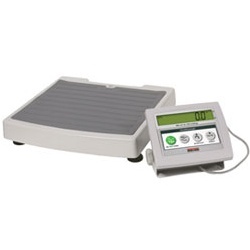 Each year customers at middle school, high schools, and colleges contact our scale company looking to purchase certified digital scales to use for their wrestling team or sometimes they just simply want to get their old scale checked and certified. Most of the time the process is pretty simple. However, occasionally the customer is not certain about what rules or regulations they need to follow to weigh a wrestler. So, before you purchase a scale or have one certified, it might be a good idea to check with your athletic conference or sanctioning body or perhaps you have some type of “rule book” to make certain what rules you need to follow. For example, one rule that we have been told is that some states require schools to use a NTEP legal for trade scale (with CoC#) for weighing wrestlers. Rice Lake’s Metrology department has retained its world class reputation through its highly trained staff and adherence to stringent handling procedures–from receiving, to calibrating, to shipping. The information below from Rice Lake highlights the standard procedure that they use upon receipt of your test weights. Here you’ll also find the best practices that Rice Lake recommends for handling weights and standards to help you maintain the best quality and integrity of your weights. Ship weights in cases and materials designed to withstand and repel the abuses of shipping. Packaging peanuts should not be used with weights, as this type of packaging clings to the weights creating static electricity which can compromise the lab environment. Loose small weights should have crumpled paper (not shredded) packed soundly in between all weights and box. Clean room cases should only be used for weight storage and are not recommended for the shipment of weights. Shipping of heavy weights (10 lb or larger) in cardboard boxes is not recommended. Larger weights should be individually wrapped or protected, supported with stiff packing material and double boxed for structural durability. Small weight kits should be held shut with secure latches, rubber bands, or tape, and placed inside boxes or bags. All weights and cases are inspected for damage and scheduled for calibration upon arrival to the lab. All stickers and marker are removed from the weights. Precision weights receiving NVLAP Calibration are checked for magnetism. A tolerance test is conducted. Any follow up with the client is completed. All weights should be clean and in good repair. Any cleaning, repair, or painting of standards in the metrology lab will incur an extra charge. Weights should be clean and in good repair. Weights shall be identified with a permanent serial number or mark into the surface of the weight. Stickers and marker are not allowed and will be removed. The added mass of the sticker may change the mass of the weight, possibly causing the weight to be out of tolerance which will invalidate the reported value on the certificate. Individual weight kits shall also be identified with unique serial numbers. Cast iron weights should have no evidence of rust, loose paint or adhering debris. Analytical weights should be handled carefully. Tolerances are small, so dirt or abuse can throw them out of tolerance. Interior of cases for weight kits should also be wiped out or vacuumed. Cases should be sound with secure latches. A customer recently mentioned having an odd question to ask. His firm does stability testing on boats and ships, and has rented 1000lb NIST Class F Cast Iron Test weights in the past. He was looking to do a similar test in the U.S. Virgin Islands and having problems finding a local vendor for test weights. Curious, we asked what exactly do you use the weights to test? Normally around here, the weights are put on a truck scale for a yearly calibration or to test a floor scale out. The customer said, he does stability testing on ships and other small craft such as yachts. With larger ships, large blocks of concrete (which are weighed before the test) are often used; however with smaller vessels where deck space is tight, your 500, 1000 and sometimes 2500 lb test weights are ideal and are easy to handle. They have the added benefit of being certified weights, thus there is little question about accuracy. On some smaller vessels they used the 50lb weights and moved the weights by hand during the test. Basically the test weights are placed on board and then moved transversely from side to side to apply a known moment as the heel angle is measured. Using the principles of naval architecture, the vertical center of gravity is then calculated. In a world where every dollar counts, more and more folks are scrutinizing every bill and every charge their company receives. Freight charges are no expception, that is why more customers than ever are investing in a heavy duty NTEP 4×4 Floor Scale. When you do find discrepancies with your freight carrier, don’t be surprised if it has to do with the readability of their scale. Recently, I stumbled onto something that at first looked coincidental. I was auditing freight bills for a customer and I kept coming up with corrected weights by the carrier and the corrected weights all ended in either a “5″ or a “0″. One shipment contained 8 pallets and each pallet had a corrected weight that ended in 5 or 0. That intrigued me. Coincidence? I then researched and found that of 170 corrected freight bills due to weight changes, all 170 ended in 5 or 0. Counting Scales are very similar to other scales in terms of weighing, but the counting scale does two additional functions, by performing operations in division and multiplication based on the internal resolution. Please continue reading below as Jim Daggon and Ann Crowley from Rice Lake Weighing Systems answer some of the common questions relating to counting scales like the Digi DC-300, Digi DC-190, DC-788 and the DC-782. 1. What is internal resolution? The internal resolution of a counting scale is the number of divisions into which it divides the total capacity of the scale. Example: A 50 lb counting scale with 1 million count resolution divides up the 50 lb into 1,000,000 parts. This means each internal resolution is translated to 50/1,000,000 or 0.00005 lb.All of the weights are calculated on this basis. For example, if some parts were placed on the counting scale, and the internal calculation was 210 internal counts, the weight to be displayed would be 210 times 0.00005 lb = 0.01050 lb. Since the weight display might only be five digits, then the weight display would be 0.01 lb. This is the external resolution. (rounded off).